Serta iComfort Blue Fusion 300 - The Perfect Plush Pillow Top? Home » Serta iComfort Blue Fusion 300 – The Perfect Plush Pillow Top? Serta iComfort Blue Fusion 300 – The Perfect Plush Pillow Top? Early in 2018, Serta announced an update to their line of hybrid mattresses, introducing seven new models. 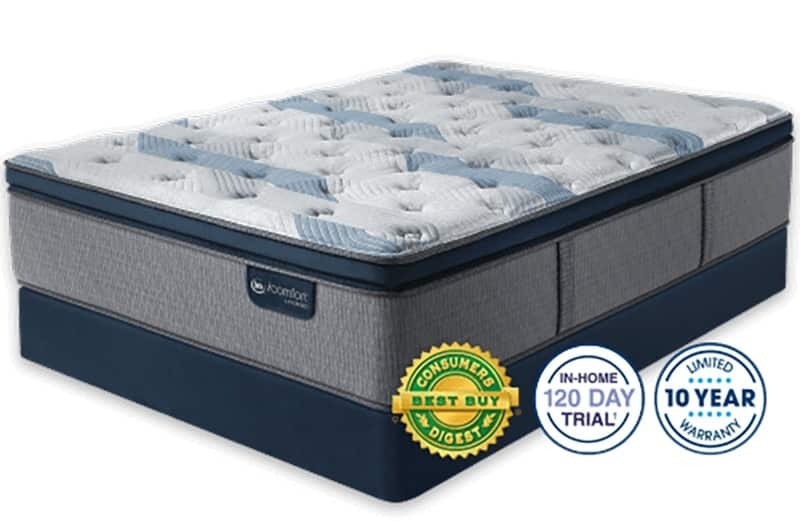 The hybrid mattresses mix cooling memory foam technology– including their exclusive TempActiv™ gel memory foam – and an advanced coil system featuring the Serta® Hybrid Coil™ for support. All mattresses feature the name Blue Fusion but are separated with different model numbers and descriptions. The Blue Fusion 300 Plush Pillow Top is plush thanks to its various memory foam top layers but could still be a universally good fit due to the hybrid coil system for added support. To learn more about the Blue Fusion 300 model, read our overview of the mattress below. While this mattress is considered plush, it’s not overly soft. This model, in particular, is described as being “in the middle of plush and firm” from the folks at Serta. Typically speaking, average firmness is about a 6.5-7 out of 10 on a firmness scale, so this will probably feel just about average, if not very slightly softer. You like a “middle of the road” firmness. This mattress is not too hard, and not too soft, making it ideal for people who prefer something in-between. While average firmness is typically 6.5-7 out of 10, this will still probably appeal to the broadest group of sleepers. The memory foam top layers might add nice pressure relief for back and side sleepers. You want a mattress that is easy to get on and off of. This mattress has Serta’s Best Edge® Foam Encasement technology, an edge support feature, which is designed to make it easier for you to get in and out of bed and maximize the full surface area of your mattress. You worry about overheating at night. This mattress comes with two separate layers of EverCool® Fuze Gel Memory Foam, plus one layer of TempActiv™ Gel Memory Foam, for increased breathability. The coil system will also help promote airflow within the mattress. You specifically want a pure memory foam mattress or total innerspring mattress. This is a hybrid model that has some layers of memory foam — but also innerspring coil technology. This means you won’t get a typical all-foam or all-innerspring feel. You prefer a harder/firmer mattress. Because this mattress is right in the middle of Serta’s firmness scale, anyone who wants a very firm mattress may be disappointed. Stomach sleepers, who traditionally prefer firmer beds, may want to try out the Blue Fusion 100 Firm mattress. You are on a budget. This mattress starts at $1,599 for a Queen at full price. It’s not the most expensive hybrid but it’s also not a fit for every budget. If you’re into plush beds, the Blue Fusion 200 Plush is $1,399 for a Queen at full price. Why Pick The Blue Fusion 300 Over Other iComfort Hybrid Models? This mattress is all about giving you that plush, luxurious pillow top feeling without losing support. It combines TempActiv™ Gel Memory foam with two layers of EverCool® Fuze foams for enhanced comfort and you’ll find support from the coil system beneath the foam layers. It has a “middle” level of firmness. This is not a super-hard mattress, nor a super-soft mattress, but somewhere in-between. It will probably appeal to the broadest group of sleepers and may feel comfortable for those who sleep mostly on their backs or couples who want something that could be a good match for both. Serta iComfort Hybrid Blue Fusion 300 Plush Pillow Top has FireBlocker® Fiber, one layer of Serta® PillowSoft® Foam, one layer of Serta® PillowSoft® HD, two layers of EverCool® Fuze Gel Memory Foam, one layer of TempActiv™ Gel Memory Foam, and a Serta® Hybrid Coil Support System with Best Edge® Foam Encasement. It is a medium-firm mattress with innerspring coil and memory foam technology. The firmness level is right in the middle of softness and firmness, making it a good fit for back sleepers but may work for all sleep types depending on your preference for memory foam. Check out our comprehensive review of the Serta iComfort hybrid series, here. I didn’t think I wanted a hybrid but when I went to the store to look at Black Beautyrest, I landed on the Serta blue plush 300 pillow top and really liked it the few minutes I was on it. I looked at your site for an online hybrid and landed on Tomorrow’s site. I’m wondering how the two compare. the pics of Serta blue plush hybrid looks like a thicker mattress than the Tomorrow hybrid. Looking for the feel I had with Serta hybrid blue plush 300 pillow top without the price tag. It’ll be pretty similar in feel, but the Tomorrow will be less expensive. How is it compared to a Tomorrow hybrid mattress? How good is the Serta icomfort blue fusion 300 hybrid? is it really cool not hot like the old memory foam matresses? It’ll be better than the old memory foam mattresses.